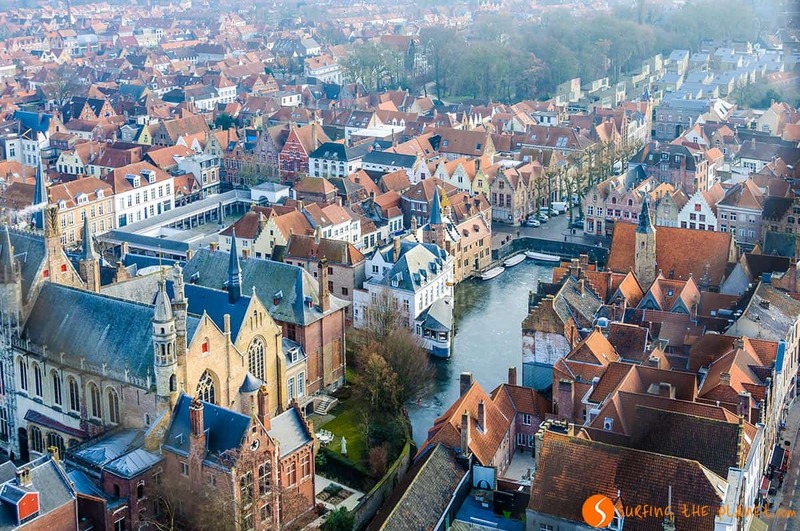 There are not many cities in Europe that can compete with Bruges in Belgium for being the most romantic city on the continent. 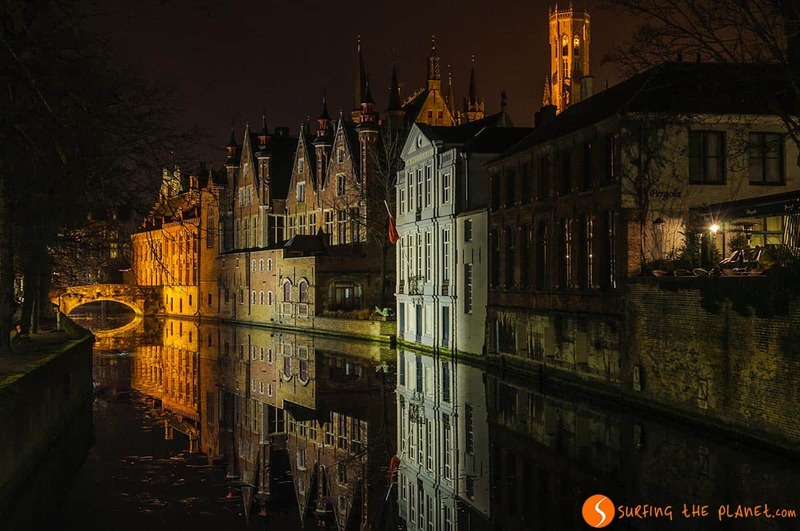 The old town of Bruges really seems to be a place that came out of a fairy tale, and at night when the buildings are illuminated walking by the canals might seem to you as if you were inside a dream. Although there are many things to see in Bruges, it is a city that can be visited in one day to get a general feeling of it. If you stay in Brussels, you can visit Bruges on a day trip without missing out on the most important things to see. Nevertheless, in our opinion, it is really worth staying for the night and enjoy the special nighttime ambience of Bruges. At night you will not only enjoy the spectacular illumination, but you will be able to walk around in peace and real tranquillity. It’s better not to lie, Bruges, as it happens with other beautiful places, is a very touristic city, but at night it becomes a calm medieval town, where time seems to have stopped. The other option you have to enjoy the calm side of the city is to visit Bruges in low season, just as we did (we visited in January). If you can go on weekdays it’s even better, since on the weekend Bruges can get especially crowded. Of course in low season you will have a bigger possibility of finding bad weather, but you will avoid the crowds for sure. 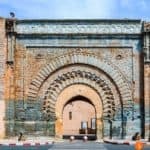 In this post we would like to propose you two itineraries. 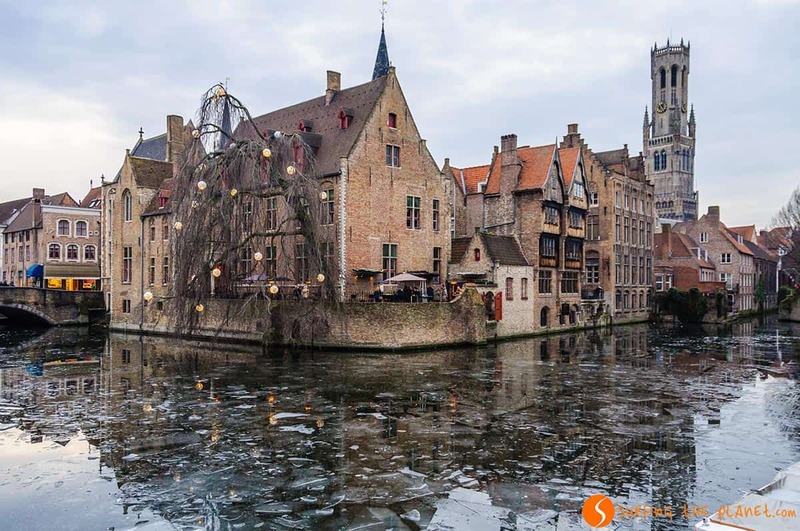 If you want to visit the city in 1 day, we will tell you the most essential things to do in Bruges in one day, while if you plan to dedicate a whole weekend to the city, we suggest you our itinerary of the best things to see in Bruges in two days. In the itinerary of the first day, we present all the things we think to be essential to see and do in Bruges. 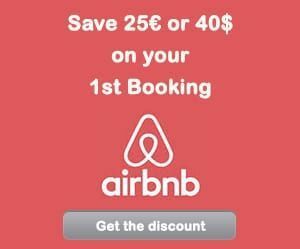 If you are looking for a personal and unique experience you can book this private tour in Bruges with a local guide. Bruges is a city filled with very photogenic squares, but even from them stands out the fascinating Market Square (Grote Markt), which can be considered as the main square of the city. 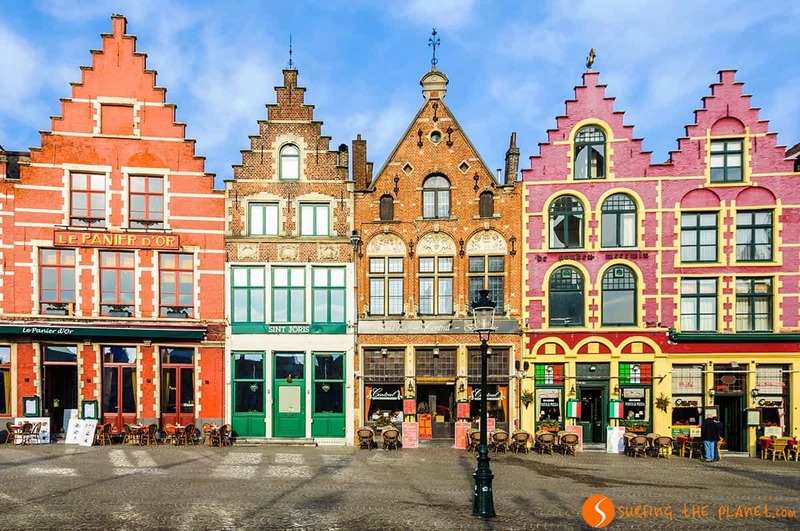 During your visit to Bruges you will cross this square several times, and every time you can appreciate the beautiful buildings in each corner. On one side of the square you will find the colorful brick houses which are shown in all Bruges postcards, they are very picturesque, indeed. You can also find here the Courthouse, the Historium Museum and most of all the fabulous Belfry Tower, which dominates the view. If you like astonishing views, one thing you must do in Bruges is to climb the stairs of the Belfry Bell Tower. From the top you can enjoy spectacular 360 degree views of the whole medieval town. You have to climb 366 claustrophobic stairs, but the view compensates for the effort. Although the views from the top of the Belfry Tower are really vertiginous, if we had to pick the best view of Bruges, it would be the view from the balcony of the Historium Museum. From there you can enjoy a fabulous panoramic view of the whole square and the beautiful buildings around. In addition, this view is completely free of charge, since the balcony belongs to the café in the museum building. Very close to Market Square, you will find another impressive square you must see in Bruges, Burg Square. 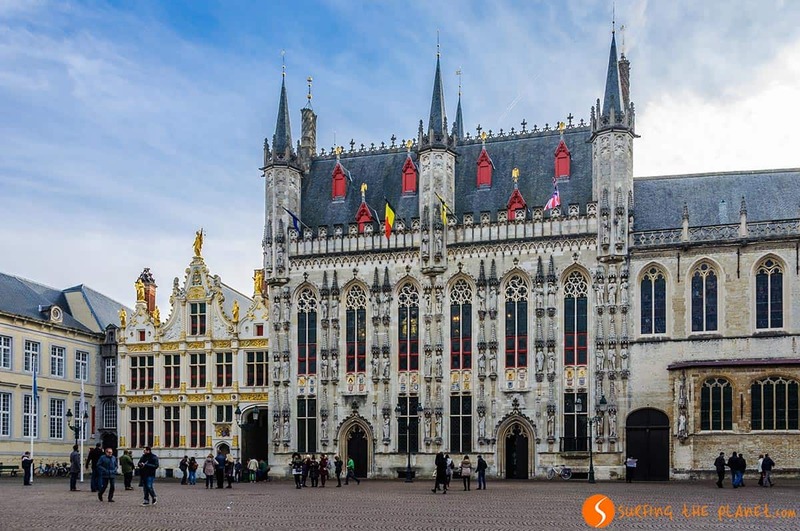 In the latter square you will find several emblematic buildings, such as the Town Hall, the Burgse Vrije, and beautiful Basilica of the Holy Blood. In the Town Hall, it’s worth visiting the impressive gothic room, which is actually neo-gothic. We didn’t have the chance to do that, since this year winter was terribly cold, and the canals were still frozen in many places. Nevertheless, another thing to do in Bruges for sure is participating in a boat excursion. These excursions take around 30 minutes, and you can see the city from a different point of view. 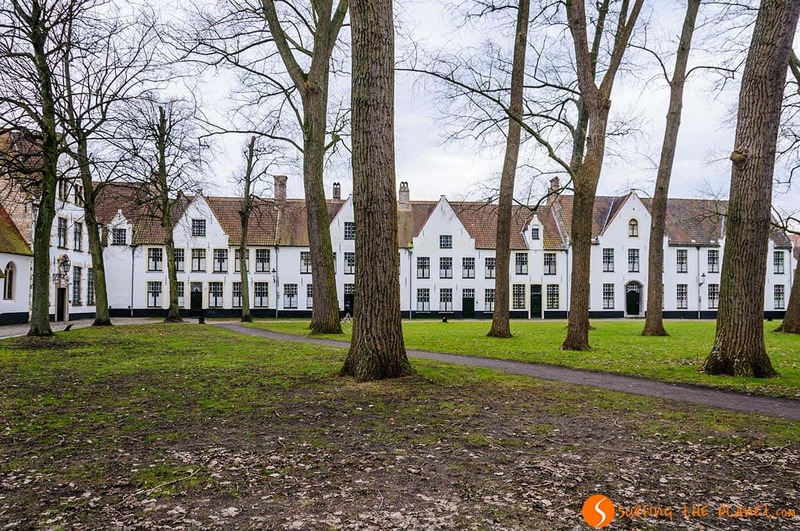 Somewhat away from the city center, you will found the Begijnhof (Beguinage), a very calm area, where you can enjoy silence even in high season. The Beguinage originally was a convent, in which the beguines (religious women) lived together (the last beguine died long time ago). In the canal near the Beguinage, you can see many swans. These animals have lived in the canals of Bruges since the 15th century. 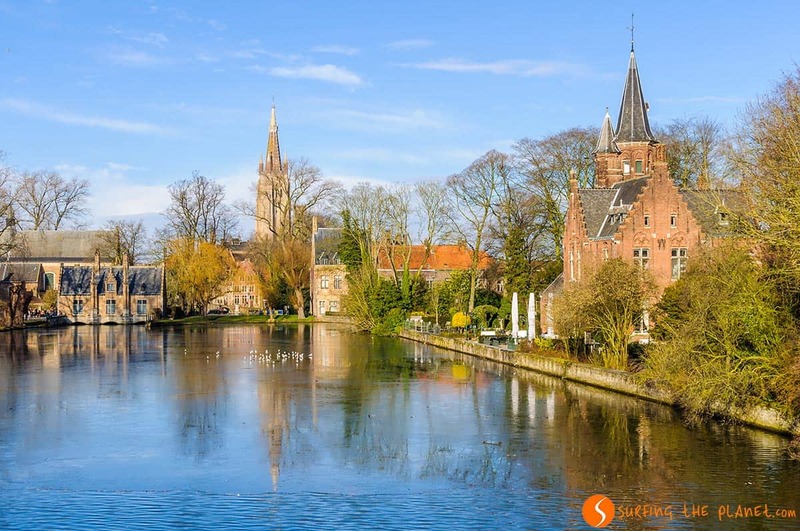 If you arrive in Bruges by train, as most people, the charming Minnewater Park, situated between the old town and the train station, will be your first contact with the city. The picturesque Lake of Love is also found there, and walking in this park is one of the most romantic things to do in Bruges. If you stay in Brussels, a great option is to visit Bruges on a day trip from Brussels. You can combine the visit of Bruges and Ghent, whereas you can also do a personalized private tour to Bruges, Ghent and Antwerp. Bruges is full of romantic spots, but probably the one we liked the most was the St. Bonifacius Bridge. This cute bridge surrounded by typical Flemish houses is hidden behind the Church of Our Lady. It’s difficult to imagine a more romantic place than this, it’s not surprising that people refer to it as the lovers’ bridge. 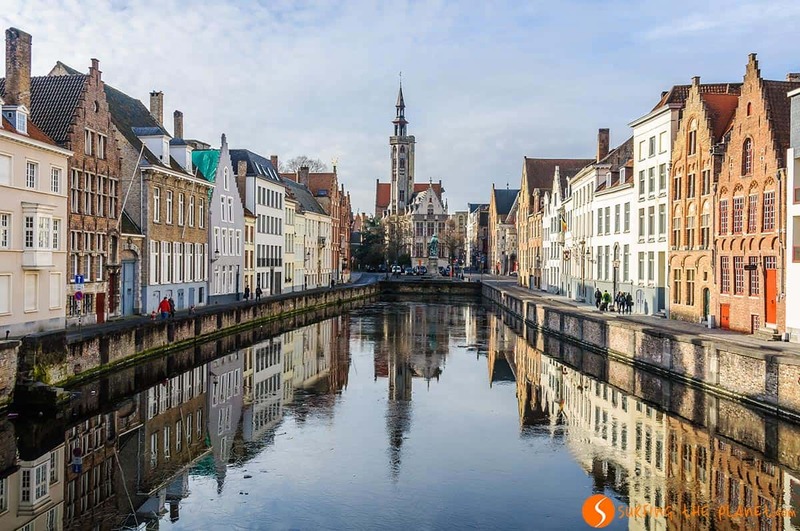 There are many beautiful churches, important monuments and museums to see in Bruges, but the best thing you can do is to simply get lost while walking between the cobbled streets and the canals of the city. In every corner you will find a nice little detail, and in many places you will enjoy beautiful reflections in the canals. The most touristic spot of the city is called Rosary Quay. 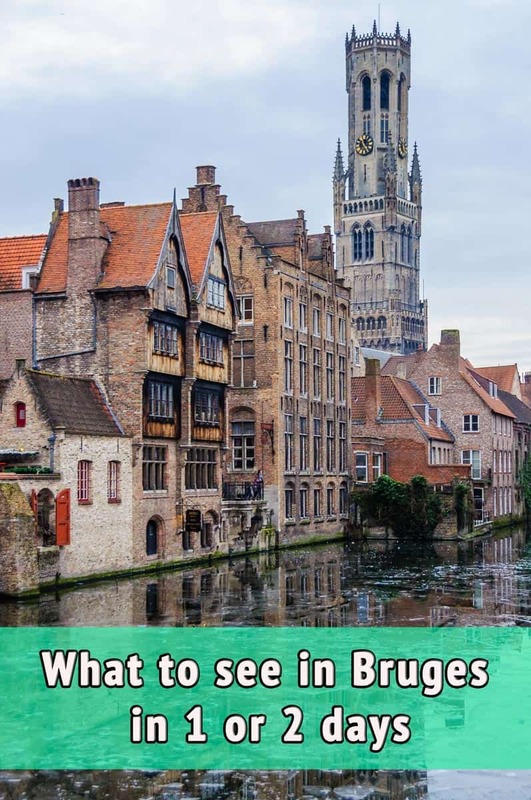 It’s always full of tourists who take pictures and selfies, but if you go there at sunset or at night, it’s more likely that you will be able to enjoy the magic of this place with views on beautiful Flemish buildings, the canal and the Belfry Tower at the background. Although you won’t have too much time, during your visit to Bruges you will also have to eat something. Fortunately, there are also quick and cheap options to fill your stomach. In Belgium it’s very popular to eat Belgian fries (don’t say French fries there) and they always offer you the option to pick from dozens of different sauces. We recommend you to try the Belgian mayonnaise, which is very tasty. Waffles (originally from Brussels) are also sold everywhere, either with only sugar or with a lot of toppings including whipped cream, chocolate, etc. Belgium, like other Belgian cities is also famous for its great chocolate, you can book here your ticket to the Choco Story in Bruges. You can’t leave Bruges without drinking a few pints of Belgian beer. The selection is infinite, but we advise you to try the beer of Bruges, the famous Brugse Zot (the fools of Bruges) in the Brasserie de Halve Maan. They sell you simple, double and even quadruple malt beer. Drinking the latter you might get drunk from just one pint. For a more extensive beer experience you can book either this beer tour or this great beer experience. 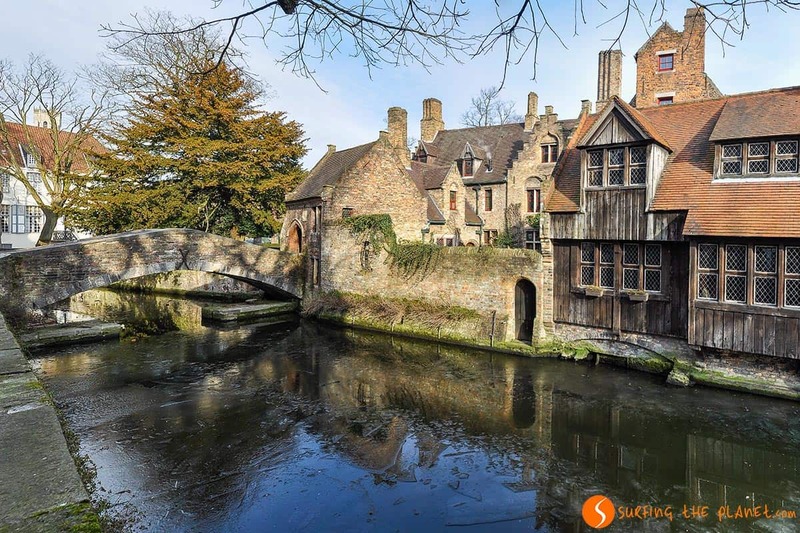 If you are interested in some great guided tours in the city, you can try this very complete walking tour in Bruges or you can also take this sightseeing bus tour. 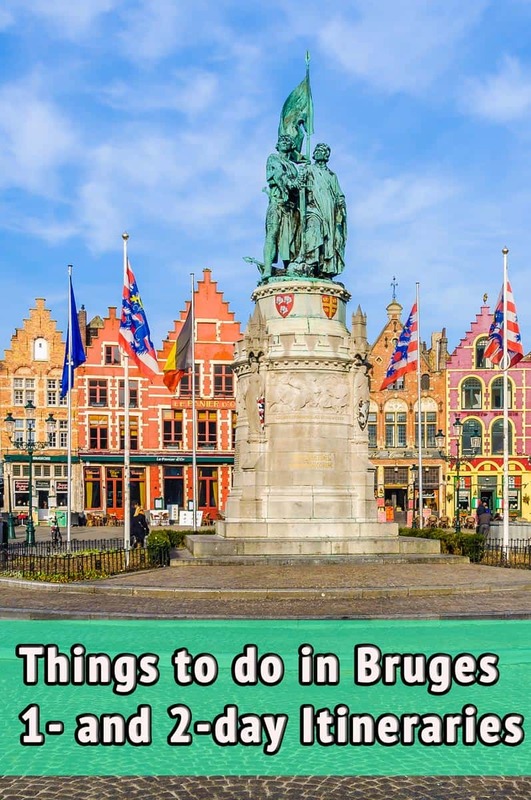 If you have the chance to spend a whole weekend in Bruges, you will find useful our itinerary about what to see and do in Bruges in 2 days. For your first day we already gave you lots of recommendations above, now we will help you fill your second day with awesome things. 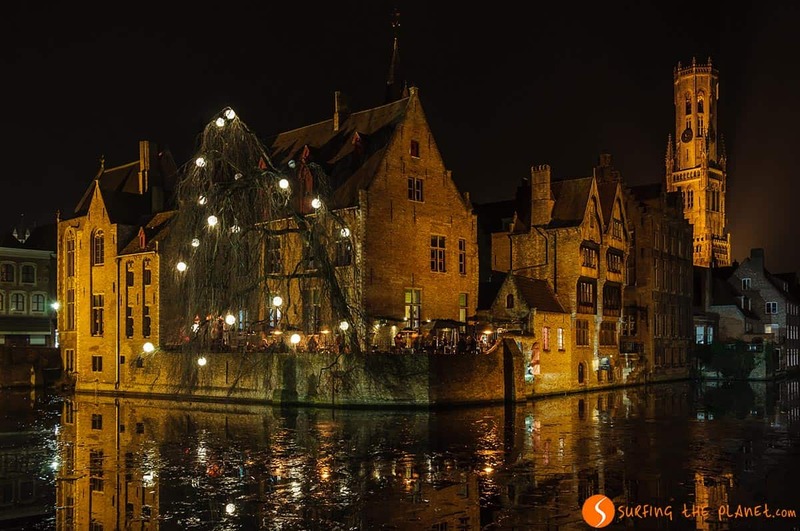 If you spend a night in Bruges, you will have the chance to enjoy the most magical side of the city. At night, all important buildings are illuminated and walking between the canals is a very unique feeling. The reflections of the buildings, the bridges and the tranquillity that you can breath in is for us the best thing in Bruges. The churches in Bruges might be less attractive than others you can find in European cities. Nevertheless, it’s worth visiting St. Salvator’s Cathedral, the most antique church in town and the Church of Our Lady, which stands out for its huge brick tower. A peculiar thing to know about these churches is that the towers have been the favorite nesting site of a falcon couple for over a decade now. These falcons are very much appreciated by locals, since they are predators of the (not so much loved) pigeons in town. The Old St. John’s Hospital has a more than eight century long history and it’s a fantastic gothic complex that you must see in Bruges. In the hospital area you can find also a spice garden of and a pharmacy from the 17th century amongst other things. In the Old Town of Bruges there’s only one working brewery left, the De Halve Maan Brewery, where they have been making beer since 1865. A guided tour in this brewery is something we really recommend you to do in Bruges. 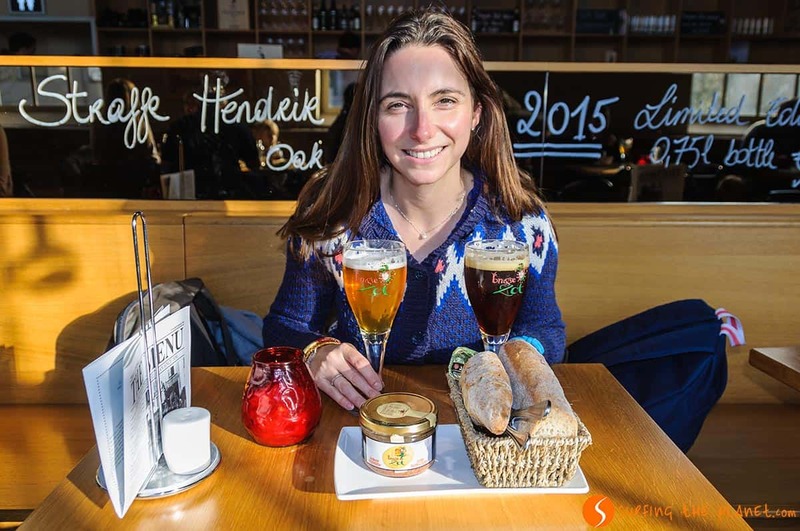 The tour lasts around 45 minutes during which you will have the chance to know about the secrets of beer production, enjoy a view from the roof terrace and taste Brugse Zot, the beer that is made there. If you want something even more special we suggest you this Tour of a 3 hour long beer and chocolate tasting. 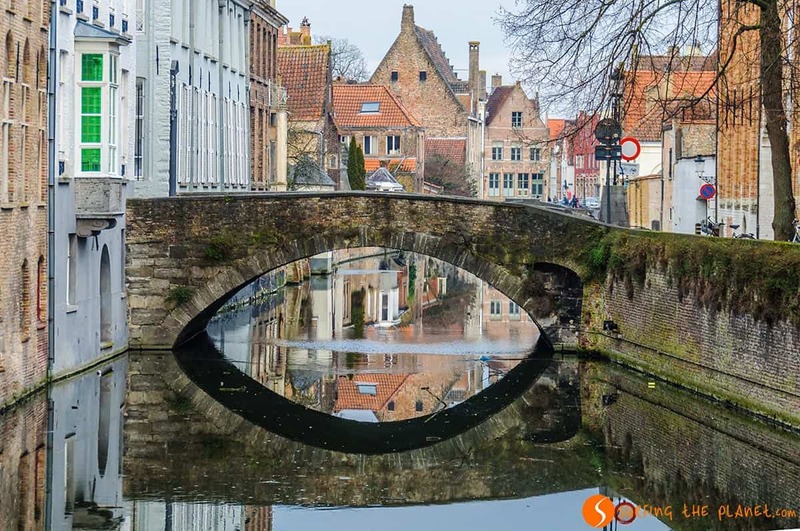 If you have already explored the Old Town of Bruges, we really recommend you to leave the center and take a walk following the main canals of the city. 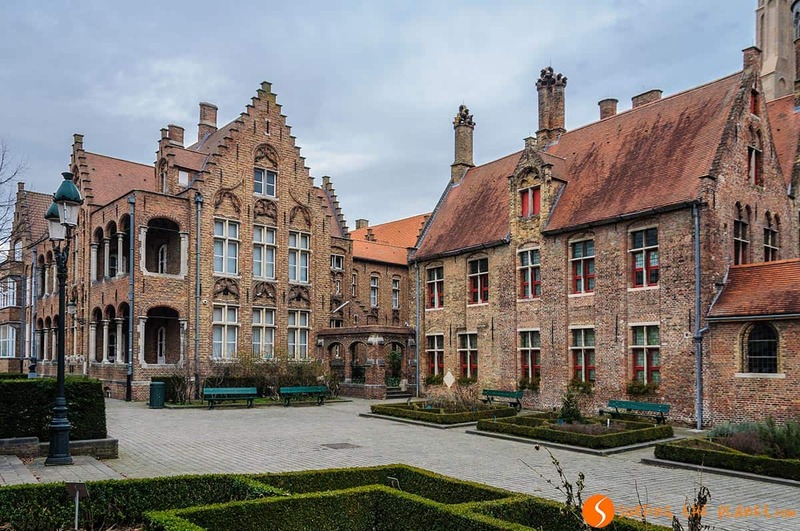 In this part of Bruges you won’t be bothered by too many other people even in high season, and you will discover many great spots, like for instance the Major Seminary, an old abbey with an orchard and green meadows around. To finish your visit, one last place you should visit in Bruges is the area where the windmills are found. This part, the Kruisvest Park, is a little bit farther from the old town, but it’s worth visiting it. 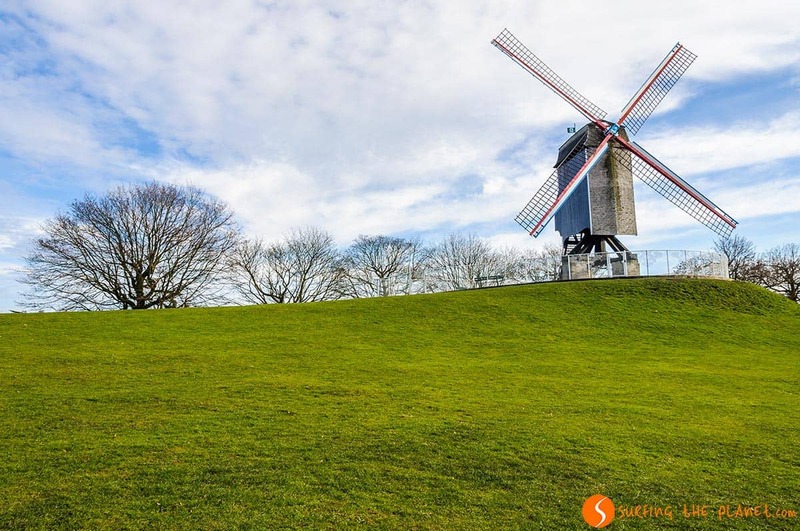 The Sint-Janshuis Mill is the most famous windmill there, and the lawn nearby is a perfect place to have some rest after walking a lot for 2 days in Bruges. Bruges, just as other cities, which are UNESCO World Heritage Site, is highly frequented by tourists. In summer the city is often converted to a medieval theme park with tourist groups on every corner, especially on weekends. If you want to get to know the authentic Bruges, we advise you to visit there outside the summer months. In winter the weather can be very cold, but we were very satisfied with the cold weather and finding few people there. One of the main appeals of Bruges is that it’s easily accessible. Brussels is one of the European capitals where low cost company flies from almost every other country in Europe, and then from Brussels Airport you can catch a train (either direct or with a change in one of the stations in Brussels), which will take you to Bruges in only an hour and a half. From the train station you can walk to the city center through the beautiful Minnewater Park. If you are lazy, from the station you can also take a bus or a taxi to get to your accommodation. As soon as you leave your luggage in your hotel room, you won’t need transport any more to explore Bruges. It’s a city that you can cover on foot. Accommodation is not very cheap in Bruges, especially if you wish to stay in the city center. For this time we really wanted to enjoy a fairy tale accommodation in this fairy tale town, so we stayed in the beautiful Victorian-style Hotel Heritage, where we had a wonderful stay. If you look for a more budget option, St. Christopher’s Inn, is a great choice, a real institution in Bruges. Amongst backpackers Snuffel Hostel is quite popular, since it’s fairly new and cheap. Amongst the midrange options, we heard nice things about B&B Het Wit Beertje and Hotel Monsieur Maurice. Finally, if you are looking for something luxurious, apart from Hotel Heritage you will also be amazed by Hotel Duke’s Castle. Book here your perfect hotel in Bruges! Find here the greatest accommodation! It’s possible to eat in Bruges spending little money, but in this case you will have to conform with fast food basically. Fries with mayonnaise, waffles, sandwiches are found in small local restaurants for a good price, but if you look for something more sophisticated, you might need to pay an arm and a leg (at least as far as how budget travelers will feel). You might do better, if you spend your money destined for food on Belgian beers, which are very tasty and not at all expensive. 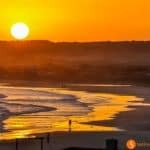 Need more tips for your travel in Belgium? Belgium is a small country with many beautiful towns found in a small area. 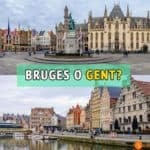 You can read here a complete guide to Ghent or the best things to do in Antwerp. In addition, you should also consider visiting Brussels, the multicultural capital of Belgium. I felt the same after watching that movie! I am happy that I got to visit finally, hope you will do that soon, too!